Oh my! June 30th began with a big surprise! In the morning, I was at the computer when I heard the termite control inspector shout from underneath our crawlspace! There was such a commotion, I yelled back through the dining room floorboards. "Are you okay!?" I hurried outside as he shakily crawled out. It turned out that the mama had set up housekeeping and had delivered four babies to our address. They were nestled together, out of the pouch, older than a month, but not ready to be on their own. Hearing their cries, she ran to protect them. My heart was touched by this nocturnal marsupial's trusting choice of residence. 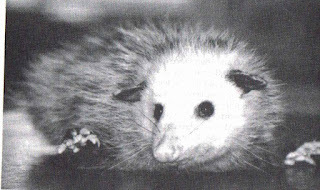 We definitely have a large dose of opossum energy! What does it mean? Opossum teaches us how to use appearances. It is the supreme actor. We may need to appear fearful or fearless in spite of how we truly feel. We may need to be apathetic or extremely caring. Submissive or aggressive. Sometimes it is necessary to "play dead." Sometimes it is necessary to put up a particular front to succeed easily and effectively. Fake it until you make it. Opossum can also show you when others are putting up false fronts. If someone is spreading rumors about you, play dead, and don't react or confront the person. Things will work out more smoothly and justice will prevail. Some questions to ask: Are you acting or about to act in an inappropriate manner? Do you need to strengthen your own appearance? Do you need to divert attention from some activity? Are others trying to divert your attention? The Feast of Mary Magdalene Day!